Brandywine Creek flooding concerns. Katherine Scott reports during Action News Mornings on August 14, 2018. 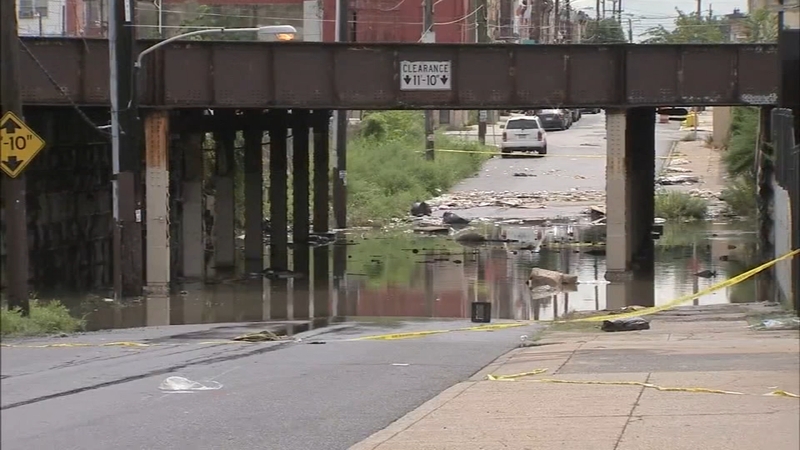 Downpours and flash floods caused traffic nightmares and damage throughout the Delaware Valley on Monday. Action News viewers have been sending in photos of videos of what they have been witnessing via the hashtag #6abcAction on social media. 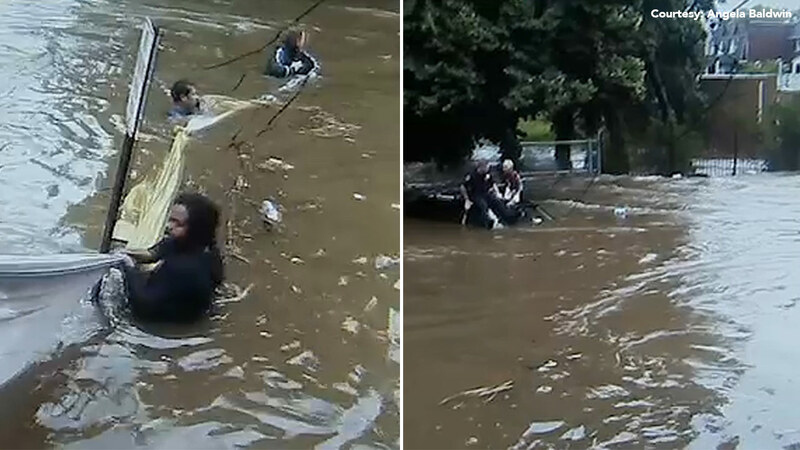 Two bystanders and three Upper Darby police officers came to the rescue of a grandmother who was trapped on the hood of her van in almost five feet of water. Darby Borough declared a State of Emergency after the Darby Creek crested over its banks. The 900 block of Main Street was flooded and multiple water rescues were required to get residents to safety. In King of Prussia, it was slow going on Route 202 as rain pelted windshields reducing visibility. Residents and businesses cleanup after the rains as reported by Jeff Chirico during Action News at 10 on August 13, 2018. Heavy flooding caused closures on the Pennsylvania Turnpike and the Schuylkill Expressway. There was more trouble over in West Chester as floodwaters lapped near doorsteps. Action News viewer Sarah Kathleen sent us this video of flooding in West Chester on Monday, August 13, 2018. In Chester, cars got stuck at West 2nd Street and Tilghman streets. First responders were called out to help. In Lower Merion, water quickly pooled onto thoroughfares like Haverford Road and began to creep across the streets. Drivers navigated around them trying to avoid the deep spots. At Haverford Station, high water prompted shuttle buses to operate between Wynnewood Road and Bryn Mawr Stations. Some commuters showing up for the trains were forced to make alternate plans. The Norristown High-Speed Line was affected earlier, but service has resumed. Action News viewer Jonathan Patten sent us this video of flooding in Hockessin, Delaware on Monday, August 13, 2018. Two children and an adult were rescued from a car that got stuck in floodwaters in Delaware. It happened around 7 a.m. Monday on the Centerville Road Ramp to the Kirkwood Highway in Prices Corner. Rescue crews waded through high water as heavy rains came down. They were able to rescue all three from the vehicle. Children rescued from car in Delaware floodwaters. Action Cam footage from August 13, 2018. Upper Darby police have warned residents to stay away from Lansdowne and Huey and Marshall Road from Lansdowne into the city. "Police are actively rescuing people trapped in their cars due to flooding. Please stay off the roads," the Upper Darby police tweeted. The Bais couple live on the first floor of the Willowbrook Apartments in East Norriton. A stream runs just feet from their back door. East Norriton apartment complex flooded following heavy rain: Bob Brooks reports on Action News at 5 p.m., August 13, 2018. They say when the heavy rains came, it overflowed the banks, and within minutes, a foot of water was inside their home. "Everything, my furniture, my clothes, expensive jewelry was wet. I was so scared," resident Brachis Bais said. Meteorologist Adam Joseph reported flooding on Lancaster Avenue in Wayne, with a reminder that first responders have been repeating throughout the day: don't drive through standing water, especially if you can't see the ground. Parts of the city were also left underwater following Monday's downpour. While the Schuylkill River remains below flood stage and is not expected to crest until Tuesday, police still needed to block access to traffic for some time on both Martin Luther King and Kelly drives due to a muddy, flooded mess. The south end of Kensington was also awash Monday, with the streets on and around Randolph and Master filled with floodwater, swamping cars and rising at least shin deep. Send us your photos on Twitter and Instagram using #6abcAction or message us on Facebook.